The perfect appetizer for the upcomming release of the “Best of” is for sure the two new videopremieres. Yes right: This time two spectaculary musicvideos are waiting for you. 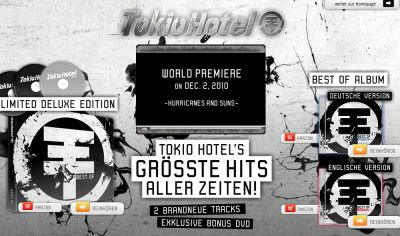 “Hurricanes and Suns” will be exclusive for the first time on TokioHotel.de and Sevenload on December 2nd. The online-premiere of the second yet non published musicvideo “Mädchen aus dem All” is waiting for you on the next-day on the official TH Homepage und on MyVideo.de.